I’m working on complex stratigraphy model as rapresented in the schetch. When I manually build a stratigraphic model, the result is not realistic.can you suggest me how to modify the model? Your method sounds like it will work if you have sufficient data for the base of Aquifer C / top of "Rock" formations. If you don't have enough real data, you can add boreholes with projected values. RockWorks can create the stratigraphy model automatically if you have some values for the top of the "Rock" unit below Aquifer C. Enable the RockWorks Onlap setting, which creates a surface for the lowest formation first, then gives that surface priority when creating the surfaces for the overlying formations. Where two surfaces cross, the upper surface is assigned the same value as the lower surface. In the example below, the brown formation takes priority over the light blue formation. Use the Onlap setting to model valley fill pinch-outs. Also, review the help topic that describes the different methods for dealing with Missing Formations. 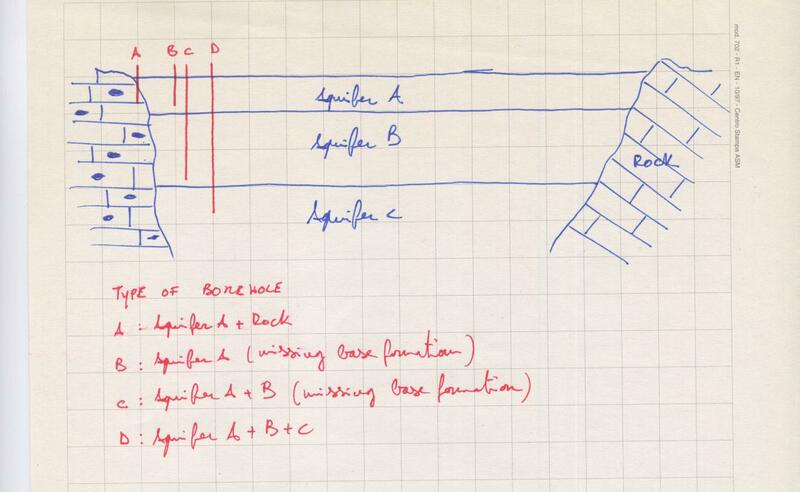 Use the Zero-Thickness Formations method in borehole "A" to help RockWorks create the surfaces for Aquifer B and C.
thank you for your replay. I've another doubt about missing formation. is correct to insert data in this way? Your method will have the "Rock" unit pinch out at the depth of 0. I suggest putting in the actual or estimated depths for the "Rock" unit. For borehole "A", put in zero thickness units at the depth for the base of the "A" and top of the "Rock". For borehole types "B", "C", and "D", I would use an estimated depth for the top of the "Rock" unit below the maximum depth or total depth of the borehole, perhaps 30 or 40. These types of wells do not have zero-thickness for the "Rock" unit.